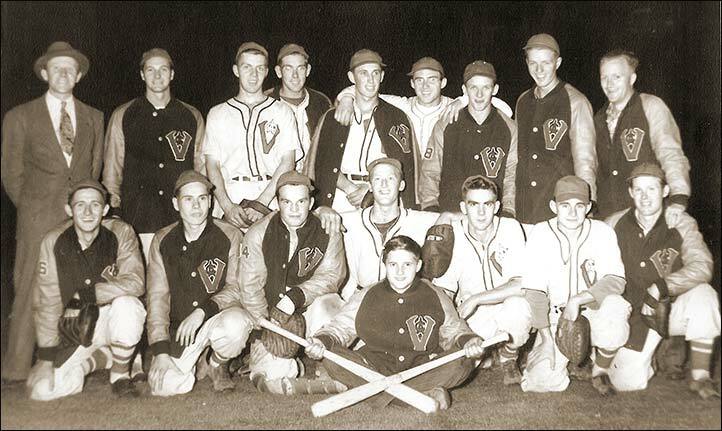 This is believed to be the 1947 or 1948 team photo of the Vancouver Athletics (league champs in 1948). Just a few IDs so far. Ron Whyte confirms that his dad Bill Whyte is in the back row, sixth from the left with his arms draped around adjoining players) and the bat boy is Bill's younger brother Jackie Whyte. We're now pretty sure that the player in the back row, second from the right is Richie Schnider. Len Corben (baseball historian & author of the lovely book on Ernie Kershaw) has done some sleuthing and confirms Les Brown is in the front row, far left (Les' grandson confirmed the ID). He believes Bill Sinser is the player with the catcher's mitt in the front row, second from the right and the player in the middle of the front row (with the first baseman's globe) is Harvey Craig. Len also found a first name for Burtwell - Bob - as the family confirmed he played on the team but is not in the photo. Thank you Len ! Further research finds a correct spelling for - Eddie Weisberg - and the fact he was a lefty hurler. Rich Necker pegs the Barry Robertshaw as the player in the middle in the back row.